This software is used to help localize applications. The official tool for localization is AppleGlot, but it's hard to understand and use. I wanted to use something more Mac-like...easier and more efficient, so I made this program. Easy to use. To start a basic localization project, all you have to do is drag in a file or application. Seamless handling of .nib, .plist, and .strings files. If you want to update a previous localization for a new version of an application, you only have localize what's changed or new. 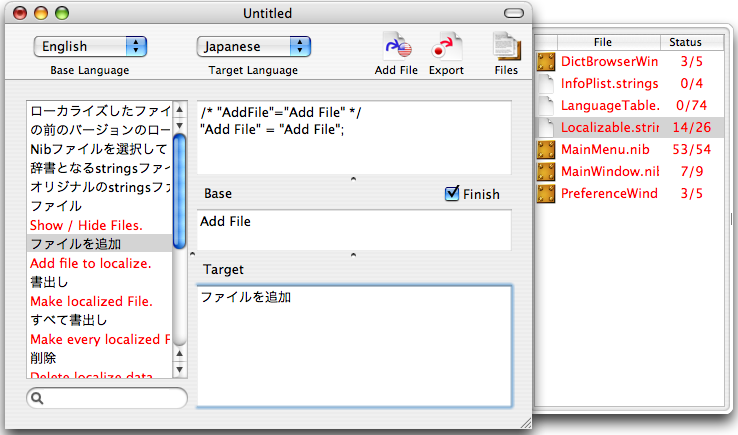 The program has a dictionary function, so you don't have to keep retranslating the same phrases over and over. 9/19 v1.2.3 Fixed bug that iLingual doesn't read previous translation result if key of .strings contains backslash character. etc. If you want to use iLingual for commercial use (to localize shareware, package-ware or to localize for payment) then iLingual is shareware and costs $30. Please check the documentation about licensing. For non-commercial use (to localize freeware or to localize as volunteer), iLingual is freeware. Feel free to use it. If you like it please make small donation. It motivates me to continue working for iLingual a lot. Thank you for your cooperation! 09.09.19 1.2.3 Fixed bug that iLingual doesn't read previous translation result if key of .strings contains backslash character. 09.08.22 1.2.2 Renewed French Resource.